*Via instant online secure server credit/debit card BUY NOW payment buttons. Where there is no BUY NOW button link with any antiqueszone web page - please email for a secure server direct payment web link to be sent to you. antiques collectibles pottery porcelain - Bargain Zone items under £145.00 GBP - with instant online secure server credit/debit card BUY NOW payment buttons. A & A antique pottery search - more antique pottery antiques collectibles arts for sale. 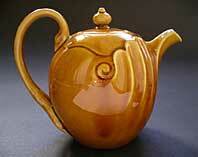 Antique pottery search across the ANTIQUES AND ARTS ANTIQUESZONE websites. How rare are antique ceramics? Antique pottery was never intended to survive and be desired. 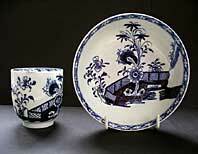 All early pottery and porcelain is relatively uncommon. 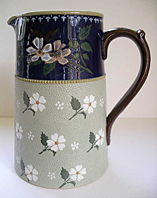 It was intended for daily use as a functional item to eat or drink from and only occasionally at first as a purely decorative item for display. Much antique ceramics will have seen considerable service over time and when damaged or out of fashion would have been discarded. It is a wonder so much rare, interesting, beautiful and collectible antique pottery has therefore survived at all: a cause for celebration among collectors and lovers of fine antiques and collectibles worldwide. Sometimes the same rare pieces are everywhere? A number of similar related antique collectible pottery pieces may become available at any given point in time. 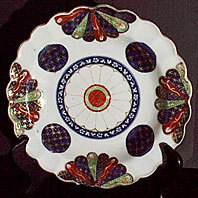 A large antique ceramic tea or dessert service is dispersed from an estate: is offered, fragmented and distributed among the English antiques trade. A good example was the very fine hand painted and jeweled Royal Crown Derby Gary Service dessert service. Made available in a variety of shapes: sold on as smaller and re-offered widely by many dealers. For a short time-scale, to the uninitiated, it appeared, that very rare pieces in a very rare pattern were more commonplace simply because there were different examples in circulation for the buyer to choose from. Specialist one owner collector sales can set records for common pieces. Many varied individual antique pottery and antique ceramic collectible items appear in the antiques marketplace because of a dispersal of a single owner collection. 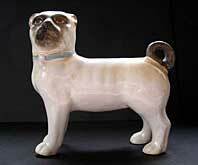 The Watney collection was the "big one" for antique ceramics in recent times comprising three sales in all. Although containing rarities many scholarly reference pieces were far from unique and some were and are quite common but sold for rare and record prices on the day. Many collectors wanted a share of a very special event and the kudos of winning any Watney piece for their collection. At times common pieces become rare. Relatively commonplace items over a five, ten or twenty year collecting time-span can enjoy periods of great rarity. Rare at any given point in time because a number of keen collectors, antique dealers or art investors all want to buy the only current available examples. "And when its gone its gone!" Pieces do not have to be unique to be rare. Answers from the Antiques and Arts Antiqueszone team. Who are Antiques and Arts Antiqueszone ? We are collectors, antique collectibles enthusiasts and artists with connections and twenty years experience and involvement with UK antiques collecting, decorative arts, art history, fine art practice and contemporary art. Where do you find antiques, ceramics, collectibles, arts? We buy from private collectors and the established English antiques trade. We are constantly on the look out for interesting, attractive and worthwhile acquisitions. Can I buy new, modern, or reproduction items from Antiques and Arts and Antiqueszone? No - we do not stock or sell modern reproductions. It is our policy to sell only genuine antiques and good antique and vintage collectibles. Do you only exhibit interesting or quality items? On Antiques and Arts Antiqueszone websites you can buy, browse and enjoy antiques and arts... You will find many interesting, attractive and often very fine ceramic and decorative arts pieces from the 18th, 19th and 20th century with a 1960s dateline. Some items are aesthetically very pleasing - while others are quite rare. 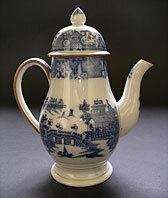 Are you Antique English porcelain and Antique pottery experts for information, exhibits and sales? We like to consider that we are but we leave that judgment to you the antiques enthusiast and collector. 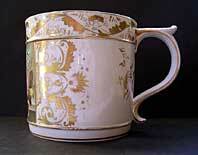 We are certainly proud of the premier quality of our Worcester porcelain collector and Antique pottery collector pages. Check them out for yourself and see what you think? We have many other websites, links and pages to help you find and buy. 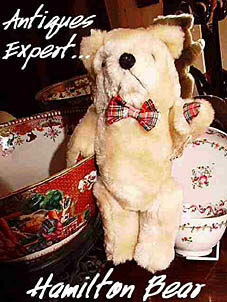 Who is antiques expert Hamilton Bear? Our resident Antiqueszone expert on antique pottery, porcelain antiques, art pottery, decorative arts and antiques and collectibles. Where are antique collectibles for sale prices listed? 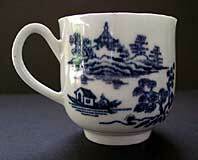 How do I find out the shipping costs for the beautiful Limehouse porcelain antique cup? Prices to ship UK, EU and Worldwide are indicated on the item description page for all items. What is the price in my local currency and do I have to change currency at the bank to buy antique pottery? Use an online currency exchange converter like XE.Com for comparison. No need to visit your local bank to change currency: you can buy direct from our web pages via our secure payment links. See next question. Please tell me how to buy an item? By using the Paypal BUY NOW payment button for your geographic location (UK or WORLDWIDE). These are located on the item description page. You will be taken to a secure page where you can pay by credit or debit card. This is the best way to pay for your antiques: instantly secures the item and guarantees early dispatch. Can I send payment for my antique pottery, antique porcelain, art pottery purchase by mail? Yes. Please confirm details by email using the link on the item description page or email shop@antiqueszone.co.uk We accept mailed payment by cheque in UK pounds (any amount) or in your "home" currency (over £50.00 GBP equivalent). Non sterling GBP cheques are subject to an additional Bank transaction fee of £10.00 GBP equivalent. Payment can also be made by supported third party cheque (bankers draft, cashier's check, money order). No items will be shipped until payment has cleared. I am located in the USA I can only find Buy Now buttons marked UK and WORLDWIDE? Use the Buy Now Worldwide button as the charge to ship to the USA and Worldwide is the same. I am located in Europe outside the UK, which Buy Now payment button do I use? You will be charged the EU shipping rate as listed on the item description page. Please use the Buy Now Worldwide button. We will refund the difference (as EU shipping is less) when the item is dispatched. I'm a UK buyer will the Buy Now UK button automatically calculate the exact shipping costs? Yes. The Buy Now button automatically adds the UK shipping cost (as indicated on the item description page) to the price of the item and indicates the total due. The antique ceramic item I want to buy is marked with a red dot? The red dot item is sold. Items still for sale on general Antiqueszone listing pages are indicated by a green dot. I cannot find the item price or Buy Now payment buttons on the detailed item description page? Is the item marked SOLD? Price and payment links have been removed. It may temporarily only be available elsewhere; email from the item description page for clarification and to check availability of similar items. How long will it take to dispatch my antique collectible item? We aim to dispatch within three working days of confirmed payment. You will be regularly updated by email. When will my antique arrive? An estimate of delivery timescale is enclosed with the dispatch confirmation email. This is a guide issued by the courier and not a guarantee of actual delivery date or time . Re. UK postage: How will my valuable Staffordshire Salt glaze teapot be sent? Most antique ceramic items in the UK are shipped via Royal Mail Special Delivery. This is an insured signed for and guaranteed next day service which is fully traceable. Can I buy antique pottery bargains on the web? 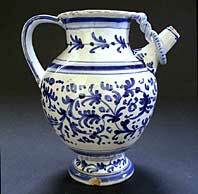 Is it possible to learn more about antique porcelain and pottery? Yes, by regularly attending good antiques fairs and fine art auction viewing days to look at pieces and ideally handle them. This is the best way of getting a feel for what antique ceramics is all about. Many ceramic antiques are not marked so studying their characteristics and knowing the wares from a particular pottery maker through handling is the best starting point for identification. Are there any good books available about collecting antique pottery and antique ceramics? There are many published works that have come to be regarded as standard reference works on the subject or a particular maker. Our recommended reading list is a very long one. Unfortunately many are long out of print and difficult to obtain. Below is a list of just a few of our favorites to get you started. How are the different types of antique marks found on antique pottery made and described? 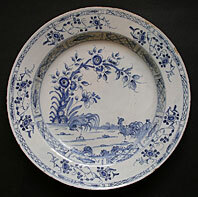 Four types of antique marks are found on pottery and porcelain. They may be painted - applied by hand with a paint brush. Incised where they have been scratched into the wet clay with a sharp pointed instrument. Impressed where a mark is left by a specially made stamp pressed into the clay and printed where a stamp is 'inked' and used to transfer a printed mark to the pot usually before final glazing. What exactly do the antique marks on my pottery mean? 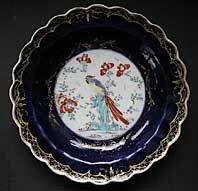 There are a number of reasons why antique marks were applied to antique ceramics - some unfortunately remain obscure. Best is when antique marks indicate a known makers mark indicating which factory made the piece. 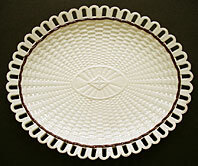 A pattern name antique mark may be present or a pattern or pottery shape number for identification for manufacture or sale. A numeric date mark or cypher is sometimes found. A very useful antique mark as it helps date the piece. Curious antique marks are the workman's marks occasionally found found on antique pottery which were probably used to identify the work of individuals for piece work payment. Reward for potting, decoration or both. 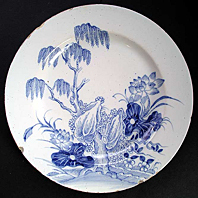 These are notably found on Early Spode blue and white; First Period Worcester and antique Derby Porcelain. How can I best use the antique marks on my antique pottery to identify the maker? The best way is to get hold of a good reference book on antique ceramic marks. For antique English ceramics you cannot do better than the Encyclopedia of British Pottery and Porcelain Marks, Geoffrey A. Godden, Barrie and Jenkins. The pocket size New Handbook of British Pottery and Porcelain Marks by the same author is a handy pocket size reference you can take with you to antique fairs and antique auctions. You will find more comprehensive and detailed listings of marks by individual factories in specialist works devoted to the work of one factory or type of ware. How long have Antiques and Arts Antiqueszone been on the web? Our very first antiques and collectibles web pages went out live in December 1998. We have continued to introduce a range of Antiqueszone websites highlighting aspects of buying and collecting antique pottery, porcelain antiques, blue and white pottery, worcester porcelain, belleek pottery etc. 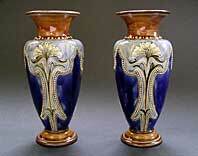 Do you exhibit all your antique pottery, antique porcelain and decorative arts for sale online? No. It is only a small representative selection. Items may be offered elsewhere. Often we sell pieces before we can fully research, photograph, write and upload a web page for them. 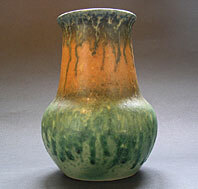 How do I find antique collectibles antique pottery exhibits quickly on the antiqueszone websites? Use the search box. This is located on all home pages and general listing/index pages. This is quick easy and fast. More fun perhaps is to browse around the back lot through the thumbnails and lose yourself among the dusty hidden virtually shelves of forgotten treasures... That way you do not miss anything and find great antique pieces you might not have otherwise thought about! Antiques and Arts Antiqueszone Search Engine gets results and covers all the websites! Tip: Submit a general term e.g. 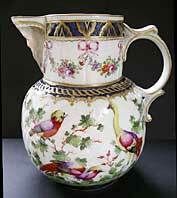 English porcelain or Staffordshire to return loads and loads of documents. For a specific search try the factory name or maker e.g. Worcester, Derby Minton, Spode, Ruskin, etc. Some search engines get a bit stale. How often is the Antiques and Arts Antiqueszone search engine updated? 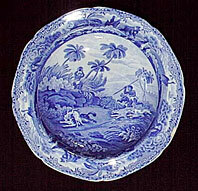 The Antiques and Arts Antiqueszone search engine is updated weekly. Are all your listed web antique porcelain, antique pottery, art deco pottery, art pottery, antique and collectibles exhibits for sale? Yes unless the item is sold or is reserved pending finalization of an order. Items for sale will have a price indicated on the detailed item description page. Our antique archive reference pages provide antiques information to help further your collecting interests. Examples of interesting antiques from private or museum collections or great antiques already sold but worthy of further worldwide exhibition and appreciation. Should I buy antiques and collectibles for investment? How are the prices of antiques decided? Prices of good antiques and collectibles are never "fixed" for long. Over time some go up and some go down. There are many factors that determine the specific selling price of antiques at any point in time. Asking for a "best price", making an offer, haggling and negotiation, is part of traditional antiques buying and selling at many UK antiques fairs and markets. On the websites items are priced to sell but we are always willing to discuss any item with serious buyers. Is it cheaper to buy antique pottery online or at UK antiques fairs and auctioneers? There is no clear answer to this as the antiques market is so diverse and virtually every sale and every item is different and unique in some way. On the web you can browse thousands of antiques for free or search quickly and purchase from a number of reputable sources with the only extra being the cost of shipping. Consider what you might save buying on the web? Admission to a good UK antiques fair costs around £12.00 and upward and looking at larger showground fairs can be very frustrating and time consuming. Travel any distance to an antiques show and that's another £50.00 petrol before you buy anything. And maybe it simply isn't convenient for you to get there at all. Buying direct from an auctioneers costs around 20% extra in buyer's premium to be added to the hammer price plus increased completion with other buyers forces up prices. Caveat emptor (buyer beware) as auctioneers give little or no consumer protection. If you fail to notice damage or restoration you were expected to notice and they forgot to mention or your purchase turns out to be not quite what you expected. How old are the antiques and arts at Antiqueszone? The oldest current antique item dates circa 1680. Our youngest from the vintage 1960s. I am looking for a particular antique item, can you help? We do maintain clients "wants" lists for regular buyers. Email your antique collectibles antique pottery and porcelain wants to shop@antiqueszone.co.uk as most of our pieces are not illustrated on the websites. How can I be sure your antiques are genuine as described? They are. We try our very best with all pieces and we are knowledgeable! Time is spent researching pieces before they are exhibited on the web. All our attributions are based on our reasonable interpretation of current knowledge which continues to evolve as new discoveries are made. We may rarely and unintentionally get factory attributions wrong on unmarked pieces so if you think you know better let us know. 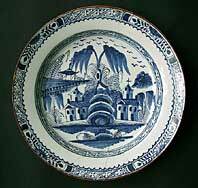 It is not so long ago that pieces of London Limehouse porcelain were mistakenly described as Gilbody's Liverpool. You say this piece is painted by a famous ceramic artist, how do you know? 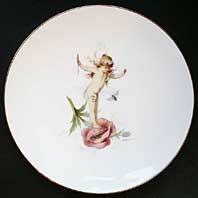 Attributions of painters of particular fine china pieces is always difficult. Early pieces are are rarely signed by the ceramic artist. We rely on our experience, compare known reference examples, museum collections, factory pattern books, remnants of sketch books left by the painter, the standard reference works, etc. Can you tell me about my antique pottery and what is it worth? Do you offer free advice and valuations of my antiques? Can you identify and value my antique ceramic dish for me? We are not the Antiques Roadshow - although we never miss the show. The area of antiques, arts and collectibles is vast: by browsing through our exhibition pages you will gain an insight into our specialist knowledge and expertise which may help you self-research your piece. If you are thinking of selling then the price or valuation you might expect for your antique will be less than you would have to pay to purchase a similar replacement item from a specialist dealer. Due to the large volume of requests we regret we are unable to offer online valuation and identification services for your antiques. Can I get a refund on my antique collectibles website purchase? Yes if you return the item in the same condition as when dispatched in accordance with our terms. Your purchase price will then be will be refunded as soon as possible. We do not want dissatisfied collector clients and wish to maintain your continuing interest in antiques as a confident web buyer and valued customer. Please refer to the Terms link for more information. I want to see testimonials, great feedback and positive comments from on-line buyers before I order antiques. 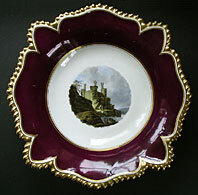 Can I keep in touch with latest Antiques and Arts Antiqueszone antique ceramics collecting updates and special offers? Where do I sign up for Qualitas the Antiques and Arts Newsletter? We have replaced our occasional antique pottery newsletter publication Qualitas with instant - Antiqueszone on Twitter - tweets on antiques. Your antiques look so good in the photographs but are they perfect? 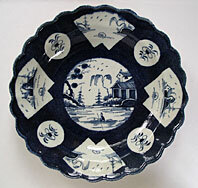 All antiques and antique ceramic pieces will show some signs of age, wear and usage. They may have undergone some restoration either relatively recently or show signs of "old restorations". 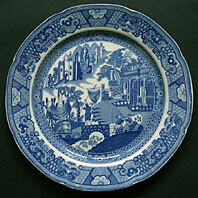 Minor damage - tiny chips, rim fritting, hairline, crazing, staining are commonplace with antique pottery and porcelain. Perfect pieces do not exist compared to modern new items. Can I use antique pottery everyday? I want to see more photographs of an antiques exhibit: from another angle and close-up; is this possible? We include a number of good quality photographs as part of the item description. These may include close up details of interesting features antique marks and any significant damages. Click on the button for larger images in a separate browser window. Send additional image requests to shop@antiqueszone.co.uk or use the email link on the item description page. All images remain under copyright © Photography at Antiques and Arts Antiqueszone and are not be used without permission. How about free Condition Reports? Condition reports are included as part of the online description for all antique pottery, porcelain antiques, decorative arts and collectable for sale. Good detailed photographs are also included to enable an instant appraisal of the qualities of the piece. If you have questions about an item or require further information send your request to shop@antiqueszone.co.uk or use the email link on the description page. I understand an antique with damage or restoration is still valuable; can you explain please? Recent price trends at both auction and leading antique fairs clearly indicate that highly desirable damaged pieces sell just as well as (near unobtainable) perfect examples. We have seen prices for attractive damaged or restored pieces sell for the same or more than perfect examples. In the exciting world of English Victorian Majolica pottery rare decorative pieces with restoration (often badly done) or minor losses, sell for the same prices as near perfect pieces. Any seasoned collector will tell you that a collection of perfect pieces is limited both in range and interest - and difficult to acquire. We always consider when, if ever, another similar or better example might turn up to fill that gap in our collection? When we buy antiques collectibles antique pottery we ask ourselves how far any imperfections spoil the appearance and enjoyment of these rare and delicate pieces? Why is the restoration of antique pottery and porcelain so important? We have no problem with restoration providing it is well done enhances the visual qualities of an attractive ceramic item and the buyer is aware of it. The work of some good modern restorers is an art and almost undetectable. When done well it improves both the attractiveness and enjoyment of the piece. It should also be viewed as conservation of a piece for future generations as often without timely attention a fragile piece would deteriorate further and might well be lost altogether. Restoration should always be left to the professional restorer who is best able to judge how much or how little? We do not automatically advocate the removal or disguise of old restorations with modern, improved methods - or suggest that minor imperfections, blemishes, hairlines should be filled in or repainted. Each piece is unique and has to be judged accordingly. The use of metal staples for example was a widespread method or repair to breaks in ceramics until comparatively recently. This was often very skillfully done. Where staples are well hidden on the back of an antique pottery plate or dish and the look for display is still good, then it may be better not to weaken a sound repair attempting to remove staples, fill, glue and repaint. Do you auction antiques and collectibles exhibits online? We very occasionally offer items on online auction sites but can and do offer better prices and deals on the Antiqueszone websites. Can I buy Antiqueszone antiques and antique pottery at antique fairs and antique centres? We currently have no plans to return to antique fairs, an antique shop or antique centre. 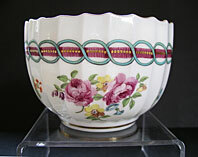 The Antiques and Arts Antiqueszone websites are very popular with antique collectibles enthusiasts and are always open. I am worried that my antique purchase will arrive broken or damaged. How well do you pack and ship worldwide? We consider it vital that we take all appropriate measures to ensure your antiques arrive in A1 good shape and preserve them for the joy of future generations of collectors. 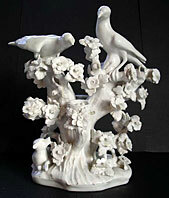 All our antiques are fragile and require individual solutions for trouble free worldwide dispatch. It is part of our service to you to supply that care. We pack very well so that damage to items in transit is virtually unknown. Why do I have to pay anything at all toward the cost of packing and shipping? Can I have a combined order shipping discount on several purchases? Every item we sell is different in size and shape but all have to be adequately packed and sent to arrive safely in a reasonable time. We cannot use one size fits all pre-formed packets for antique items. Relatively low priced antiques and collectibles can cost as much or more to send than higher value pieces. A fact of life of mail order; an items weight, size, awkwardness and fragility all add to the costs of buying your antique. Pieces become extra-weighty when double-boxed for added protection to withstand the rigors of international airmail shipping. The slightest increases in parcel shipping weight adds considerably to the courier/mail charges part of the total costs of worldwide shipping. When sending a number of antique collectibles pieces worldwide it often works out cheaper to send each one separately so it is not always possible to offer a combined order shipping discount on multiple purchases. We always consider the most appropriate combination of packing and shipping for your antique to arrive safe and secure in a reasonable time. We only offer something that here in the UK, we like to call, quality antiques, collectibles and fine art services backed by our dependability, enthusiasm, expertise, experience, knowledge, reliability and good old fashioned quality service. We operate strict antique pottery quality control and quality antique vetting of all our antiques and collectibles at Antiques and Arts Antiqueszone. The term "antique pottery" appears subject to a great deal of web-driven confusion and downgrading as to what antique pottery is and is not. We are very clear what antique pottery means here at UK antiques enthusiasts and fine art consultants Antiques and Arts Antiqueszone - based in the very heart of the UK, home of some of the very best antiques and antique pottery collectibles available anywhere. Our working definition of "pottery" is - "pots, dishes or other articles made of earthenware or baked clay and that this can be further subdivided as earthenware, porcelain and stoneware." Our working definition of an "antique" has always been - "a collectable object such as a piece of furniture, ceramics or similar work of art that has a high value because of its considerable age." Our working definition of "arts" is - "works produced by skill, imagination and creativity." Our working definition of "art" is - "art is long, life is short." REMEMBER: click on our antique pottery link to our ANTIQUESZONE ANTIQUES AND ARTS antique pottery exhibition to enjoy some of the very best of antique collectibles antique pottery on the web.